The opening of Muckrach Country House Hotel is looming and the rooms are looking boutique and chic! When we open the doors on the 30th April the hotel will burst into life consolidating all of its nurturing in the last 12 months. 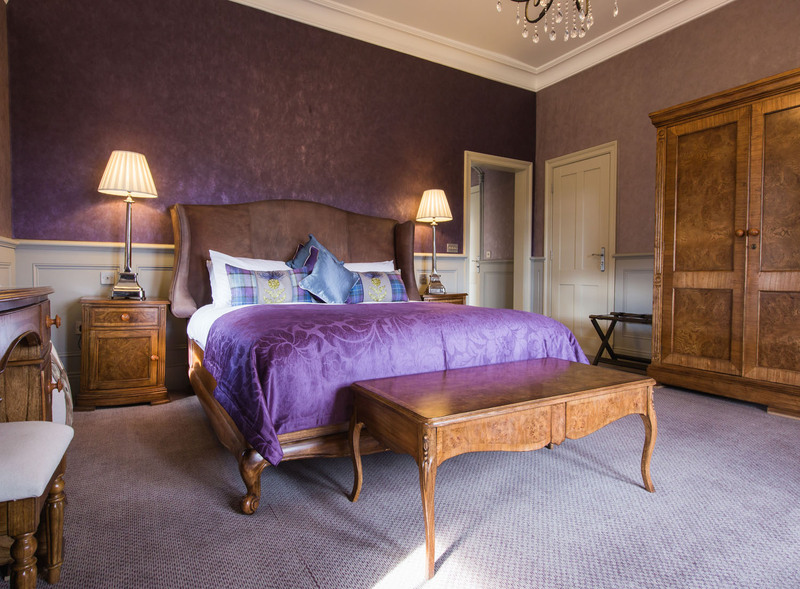 The bedrooms are ready for guests on their Scottish Highland holidays and the menus are nearly ready for everyone to enjoy in the Coffee Shop, Restaurant and Bar. Boutique and chic the hotel may be, but a Highland welcome is high on the agenda to embrace all that come through the door. The public rooms in the hotel are open to everyone to enjoy a wee blether (good conversation) with friends and family over drinks and tasty treats from Rayner’s menus. The Drawing Room, a grand room filled with light encourages us to enjoy views of the mountains and landscaping through its large windows. 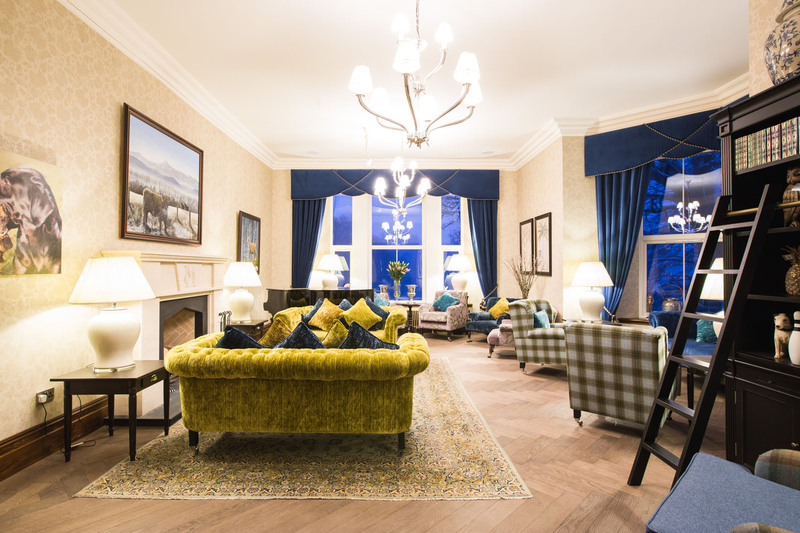 The sofas are rich chenille with tones of gold and blue positioned to sit in groups around the room. Imagine a relaxing afternoon tea or pre-dinner drinks whilst listening to the tinkling of the baby grand piano in the corner. 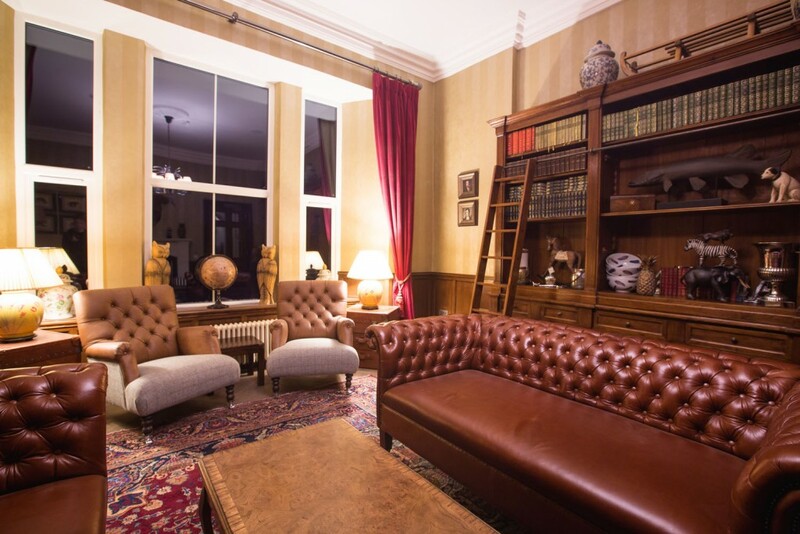 The Library has a cosy log burning stove with sofas positioned alongside it and dual aspect windows filled with sunlight and views of the pastureland and mountains beyond. You can imagine all your favourite people together in one room, chatting & laughing whilst being served with coffees and cakes or wine and nibbles. 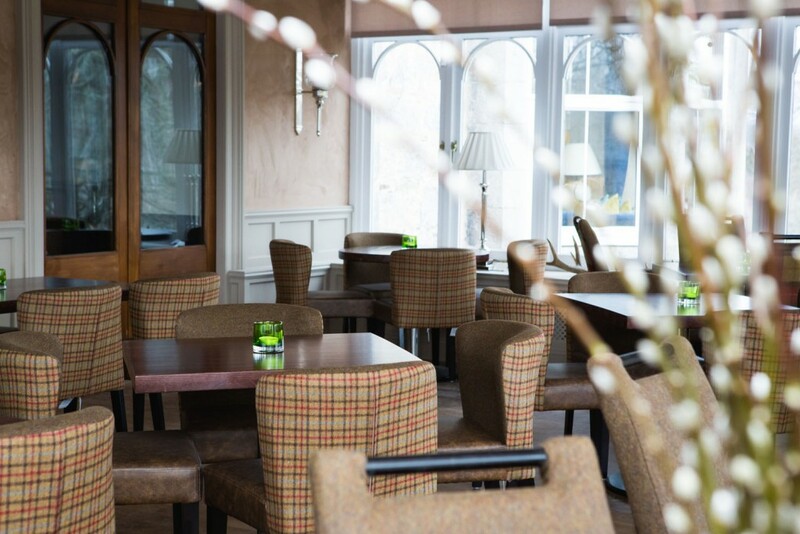 The Coffee Shop and Restaurant in Grantown on Spey will be open 7 days a week from breakfast through to dinner for residents and non-residents. Head Chef Rayner Muller has put together menus using the finest ingredients from Scotland’s larder, including Inverawe smoked salmon and Grantown on Spey’s Grants Butchers renowned black pudding. Rayner is keen to deliver menus that are homestyle cooking with a twist, such as the Muckrach Beef Burger and the Roasted Cauliflower Risotto by night or by day the Ultimate Muckrach Club Sandwich or Homemade Waffles with smoked bacon & heather honey. Sit in the light-soaked Conservatory and enjoy the surrounding views whilst sat in cushioned chairs styled in plaid and leather. 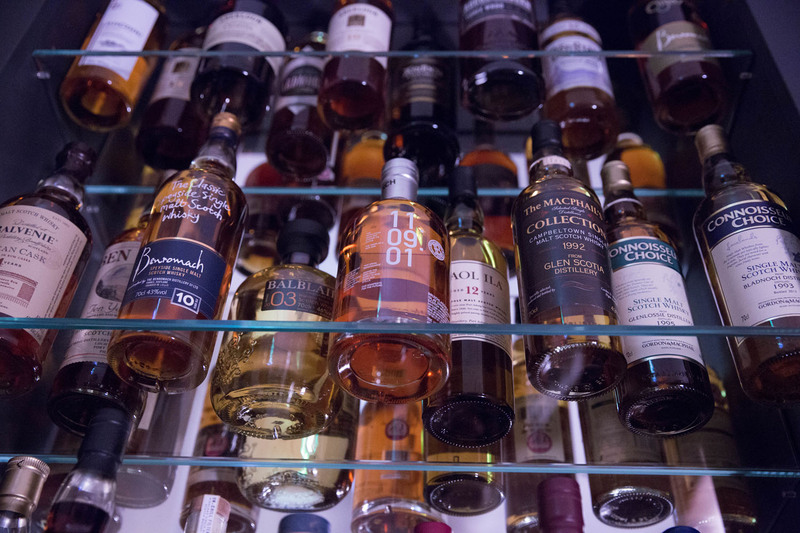 The Bar is stocked with 100 whiskies and 30 gins, plus good wines, champagnes and spirits. Our team have been ‘cocktail-trained’ so we hope to have a cocktail menu in place very soon! The Bar is dark and sultry to emanate the whisky bar experience, enhanced by comfortable leather and plaid chairs, marble topped tables and a drink’s service from our lovely team. The Bar enjoys local beers from Cairngorm brewery, waters from the Glenlivet estate and many locally distilled whiskys and gins. If you are looking for a private dining experience or a meeting room, the Grant Room has been designed to allow you to enjoy food with friends, families and business colleagues. Additional equipment is available for business meetings such as screen, flip charts, refreshments and WiFi. If you have a party or a meeting you’d like to host then you could consider the Grant Room with its panelled walls, large fireplace and luxurious soft furnishings. Please contact 01479 851227 or email [email protected] with any queries. Boutique and chic oozes from upstairs too, as you wander under the crystal chandelier in Reception and make your way up the staircase on the Axminster carpet, under the crystal globe lights, you will reach the bedrooms. Each of the 11 bedrooms has been individually styled with fabric wallpapers, Frank Hudson furniture, stunning chandeliers and Hypnos mattresses. All completed with Porcelnosa tiled ensuite bathrooms, in room entertainment and WiFi. 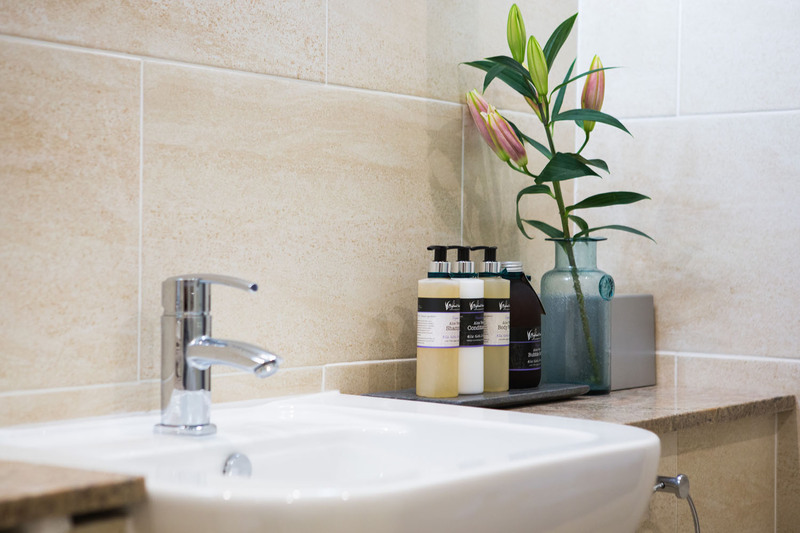 Enjoy Highland Soap Co toiletries (made on the west coast of Scotland), white fluffy towels and soft towelling dressing gowns. As we near the opening the final details are added to the outside of the hotel too. Landscaping, terracing, lighting and planting are the focus of the next few weeks. We should successfully add a bit of boutique and chic to the outdoors too, particularly on the Terrace Bar with the patio furniture and umbrellas. We hope you will join us, whether it be for a coffee one day, a wee dram, lunch or for a stay at Muckrach. A Highland welcome awaits you.